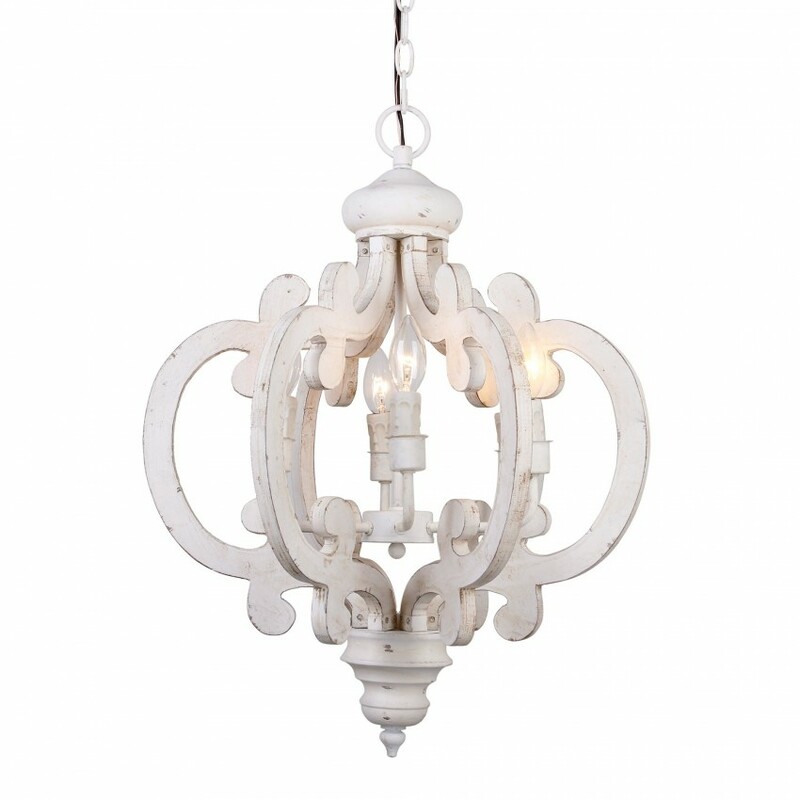 A dramatic, stunning way to light up entryway, porch, hallways, dining room or eat-in kitchen. 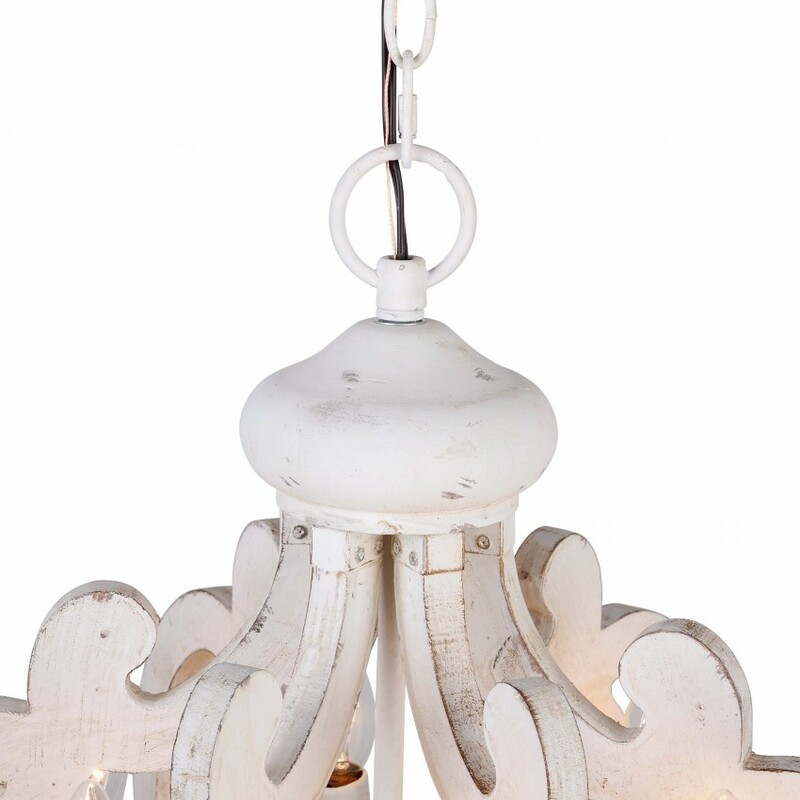 This beautiful Wood-Metal Chandelier will add an elegant touch to your home decor. Finished in antiqued white. Made of wood and metal. Q Can the chain links be shortened significantly? Q Can this be used outdoors? - I'd like to hang it from my pergola. Q can you please tell me the specific type of bulb this chandelier uses - I purchased this chandelier several months ago. A Yes it takes any bulb with a candelabra base. If you search for candelabra base bulbs you can use any of them that suite your style bulb. Q Is this pendant adaptable for sloped ceiling? - Do you carry the adapter kit? A It is better to install on a horizontal ceiling. Q Not black... - Does this light come with a white chain and mounting plate? A This light come with a chain and mounting plate. The color of the chain just as the picture shown in the listing. A It is a color that is hard to explain. It is a off white to a cream color and the entire chandelier is antiqued. All batches from the manufacturer do vary slightly in color. Q Can I get a longer chain? I need at least 6 ft and would like white. A We are so sorry to tell you that we do not have a longer chain. The length of the chain is 39". Q For our foyer - Can you easily shorten the cord and chain on this one? A Yes the links can be removed and shortened. Q Bathroom chandelier - What portion of the chandelier is wood? A The wood part is the crown ( globe part) The rest is metal. Q Do you have a smaller version. Is there one? A I am sorry our manufacturer doesn't make any smaller one of this item. Q Do you have to assemble this? Also how long for shipment to arrive? A Hi there, yes, the assembly is required, 1-3 days means in stock, 1-5 weeks means out of stock need to wait, please contact us though E-mail for the ETA. thanks! Q What color is the chain and wire? It looks bronze in the pic. Q Crown wood chandelier... - Can this chandelier be used with a dimmer switch? A Yes you can but be to get a good enough dimmer to handle 5 bulbs at once. Witch ever bulb you choose multiply the amps on that bulb times 5 and make sure the dimmer you buy can handle at least that many amps or greater. If you get one with less amps than the bulbs it will burn the dimmer out and will no longer work. A Yes it will hang straight down where ever you hang it. A We are so sorry to tell you that we do not have a flush mount of this type. Q Shipping - Does this fixture ship to Canada? Q lightbulbs - Can you tell me exactly what lightbulbs to buy for this chandelier? A You can just buy the E12/Candelabra socket bulbs for this chandelier. And the bulb type can be Incandescent/Led/CFL. Q Chandler - I want to hang this in my foyer We only have 8' ceilings Will it work? A The height of this chandelier is H23 1/2”. 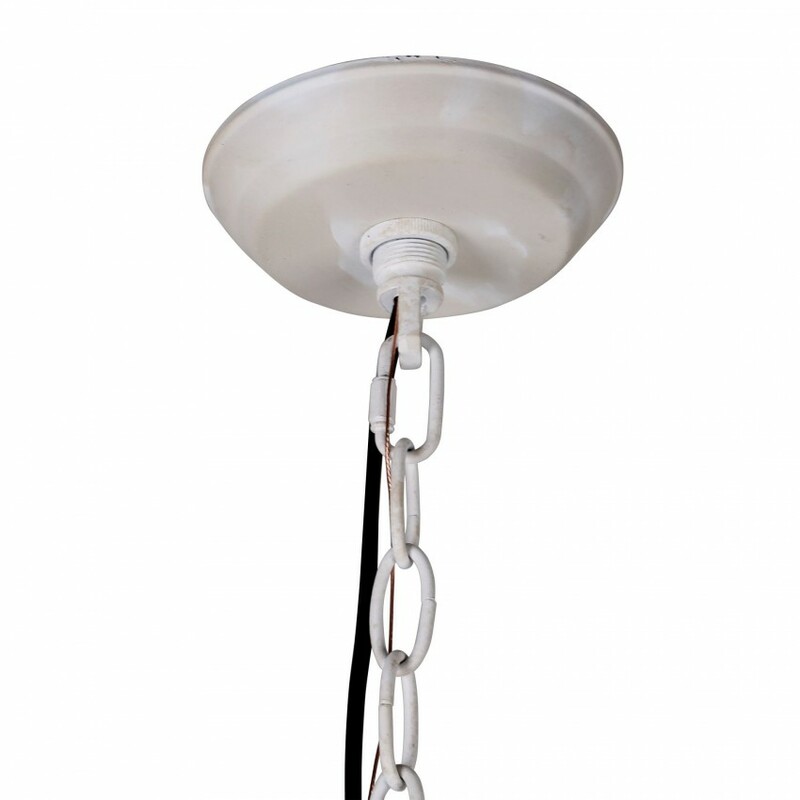 The length of the chain is 39", which can be shorted by removing some links when installing. This light is so beautiful in person! It is exactly what I was looking for for my entry. I was concerned that it may not be big enough but it was much larger than it appears in the picture. My only complaint is it did not come with instructions.. still worth it though! I purchased this item for our 1916 Victorian farmhouse. 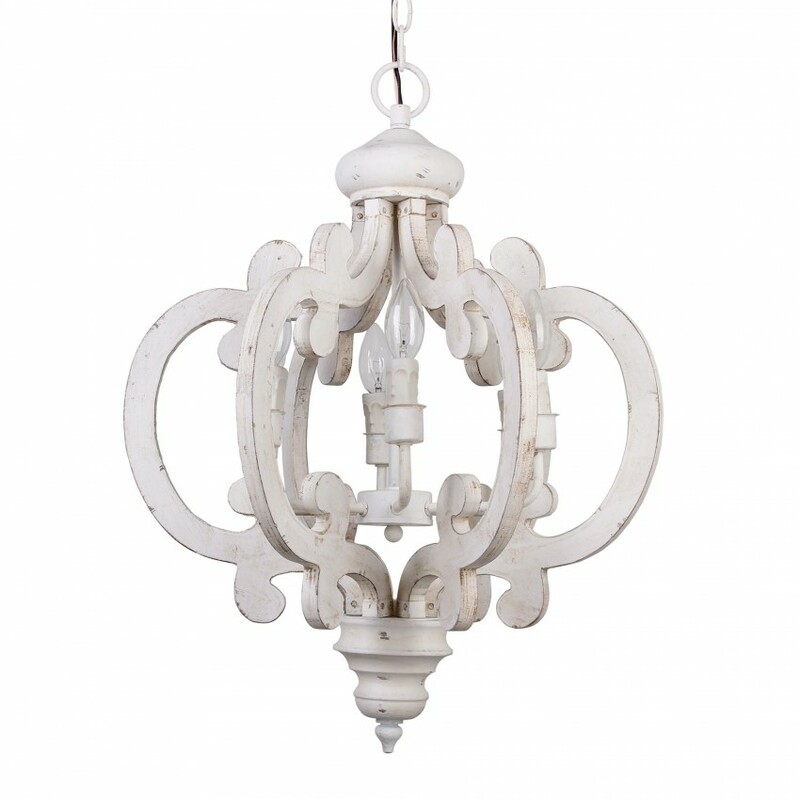 For my tastes, this chandelier is the right blend of farmhouse material/color plus Victorian shape/ornamentation. It was a little too big for my entryway, but I'm planning to place one at the top of my open staircase and one in our turret-style den. Took a little while to arrive, but worth the wait! no complaint from me!! husband said wiring was different. not color coded. but they look beautiful! haa some blue gray colors too in the distressed areas. When I saw this chandelier I thought to myself, "this is it! I have to get it!" Shipping was quicker than expected. No instructions were found in the box which sucked! The picture did nothing for this chandelier in person its just so much more beautiful! Its a nice big size my table sits 8 people and the chandelier looked perfect sitting on top of it. It has a distressed look to it which bring out blue and gold colors. The fixture was a little complicated to install but above all it looks gorgeous! It was worth every penny! I've been looking for something different for my dining room for some time. The price was right and it looks great. Very pleased with this purchase! The finish is the perfect and matches my French Country/Provincial décor. I installed it in my home office, but it would be wonderful in a small entryway, dining area or any area where you want a special focal point. LOVE it! All the reviews helped me to buy with confidence. It's perfect in our breakfast nook. I added vintage bulbs. Easy to install, too. I literally cannot express how beautiful this light is!! It is going in my horse barn bathroom. I always say if you are going to make/construct something make it cute! This chandelier definitely exceeded my expectations! It is stunning, especially with my farm table! Perfect size for my small dining room! The table in there is about 6ft to give you a better idea for sizing. Love this chandelier! It is amazing. Great price and arrived quickly!! This light is perfect for my dining area. Elegant and unique but warm and subtle. There weren't directions with it so the install took a little longer than expected, but when doesn't that happen! So pleased with the result! Its just like it appears in the pics. The bracket isnt threaded, so it is kind of tricky to install, but once its up its all good! I purchased this chandelier to hang in my small dining room. I revived it in less than the quoted shipping time and it came I damaged. Originally I thought it may be a little to big but after hanging it hung, I absolutely fell in love. The light is more of an antique white- just a little lighter than the picture. I would caution that this light came with no installation instructions so if you don't know what you are doing, it may be best to higher a professional. This light is bigger than O expected. It’s a great statement/focus piece and it’s good quality. I love the look of this light and the fanciness it brings to the room. Overall, a great buy! I was a little skeptical when I first ordered this. Once I hung it up in my dining room, it changed the whole look of the room. Looks more like a piece of art than a chandelier. I was very happy with both its look and quality. I have been looking for a chandelier for my front room for a long time and when I saw this I fell in love! If fits perfectly, it arrived in a timely manner, and is in great condition! This is a beautiful fixture. It was exactly what I was looking for and a great price! It has a distressed off white finish with blueish gray and a little gold accents. As far as installation, I had a handy man install it. He had no problem at all. It puts out a ton of light which is good because I it in my closet that I just redesigned. I think you could put a lower wattage bulb in it to make it less bright. 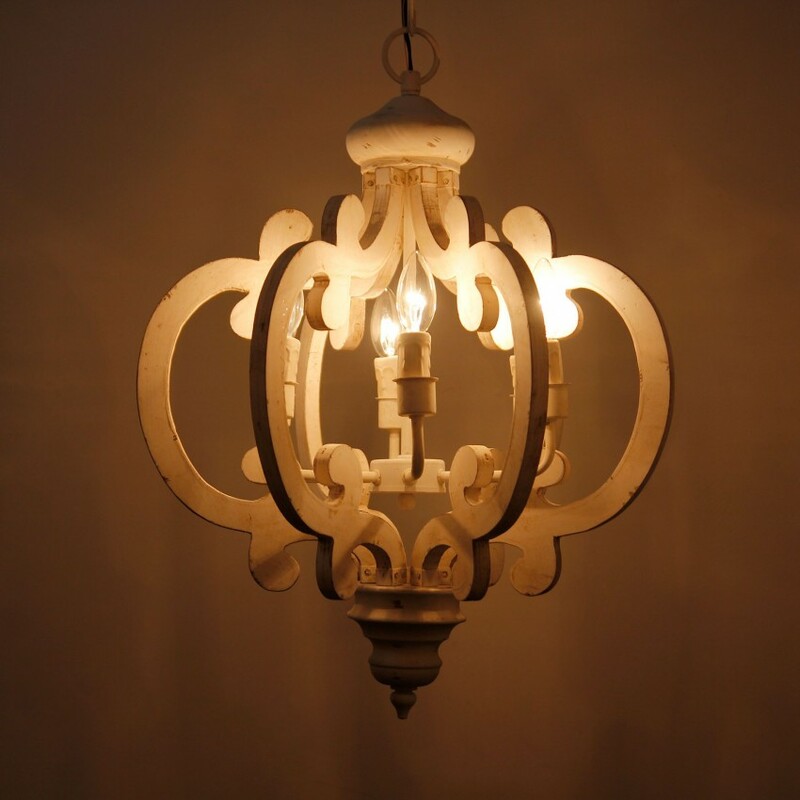 I really love the fixture! I submitted photos, one with the light off and the other with the light on, and a close up. Absolutely perfect design for any shabby sheik or distressed design. I love it! 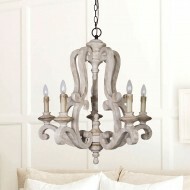 Just purchased this chandelier and love how it looks above the tub in the master bathroom. It did not disappoint at all, perfect size and color. The only problem was that two weeks after I received it, I noticed it was on sale for $50 less than I purchased it for. Wish I could of received a credit for the difference. 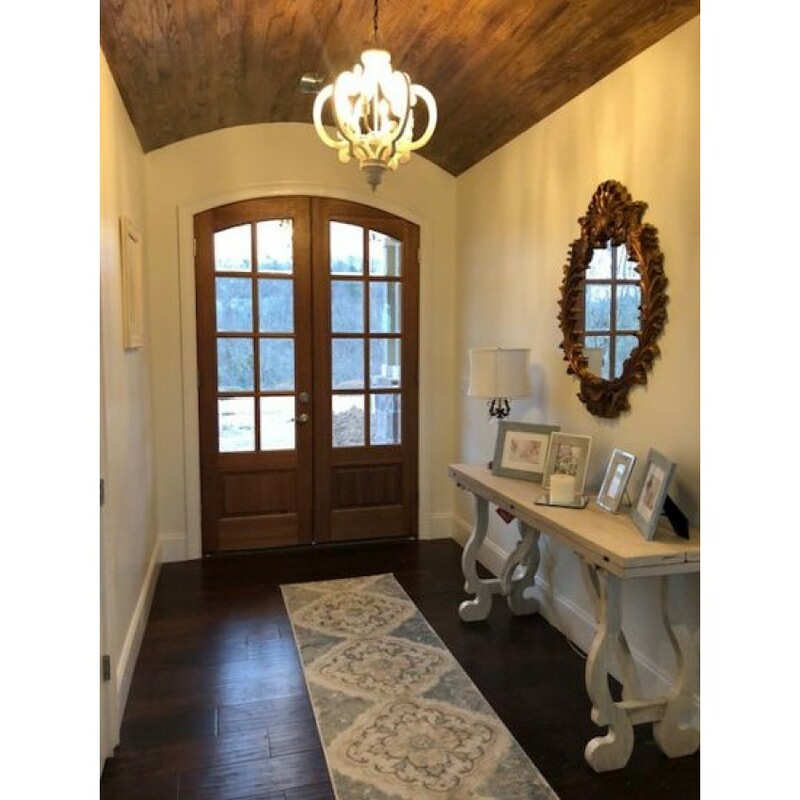 We recently remodeled our living area and since our home is an open concept design we also needed to find a new chandelier for the entry way that would be a better match for our new furniture. This chandelier exceeded my expectations! It is absolutely gorgeous and of high quality. The color and finish are accurately represented in the picture. 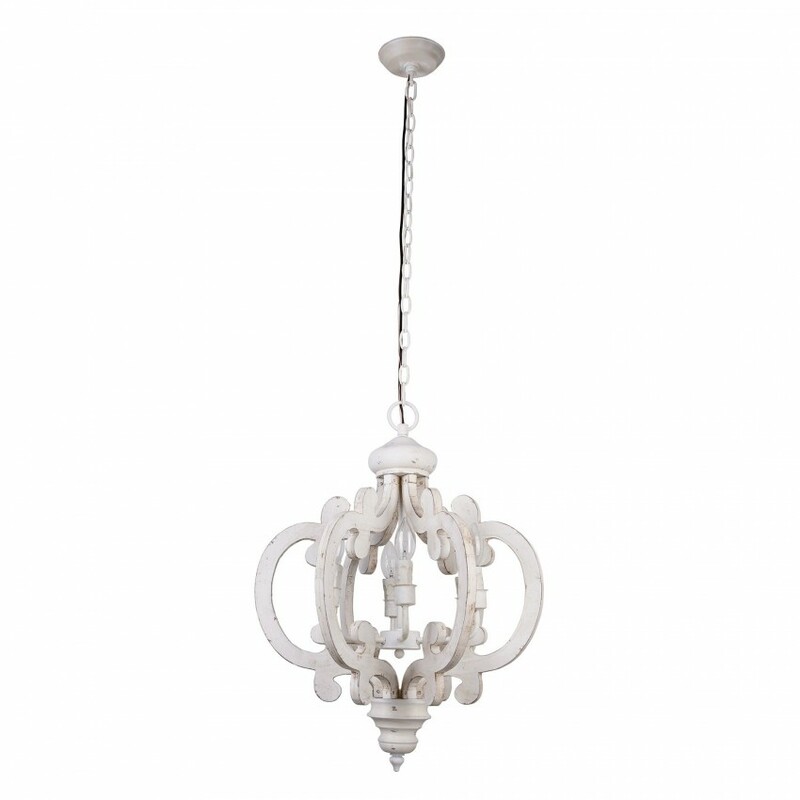 If you are considering this chandelier, order now because I can't imagine the inventory will last long at this price point! LOVE it! Very cool! A great deal. Light and bright. Install a dimmer switch for a candlelit bath! We love it! 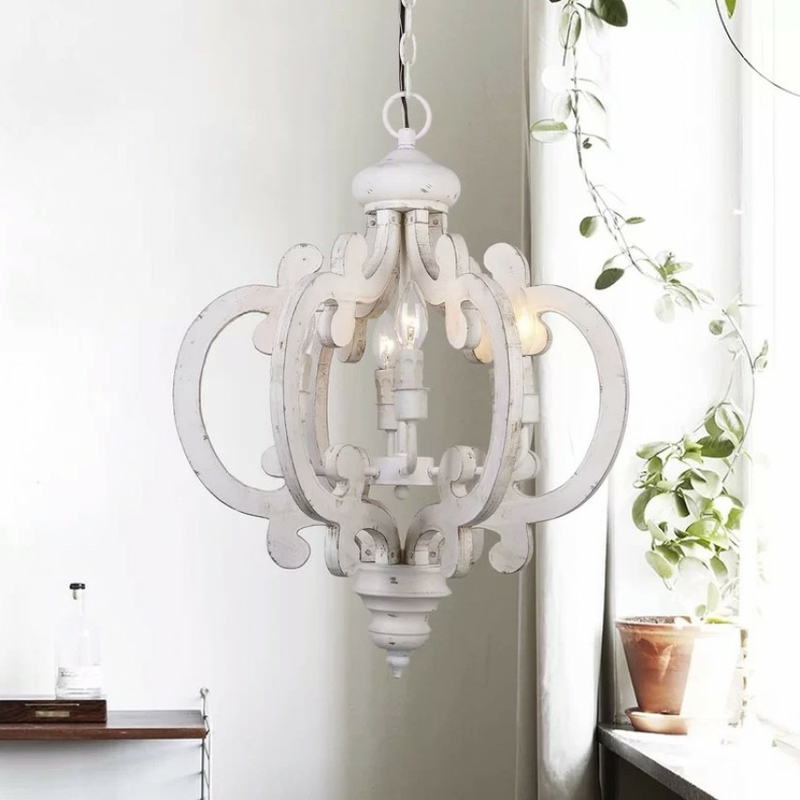 This chandelier is a nice size, and it's different - I bought it for the bathroom, but I think this would look great anywhere - in a bedroom, over a dining room table, or in an entry way. Gorgeous! 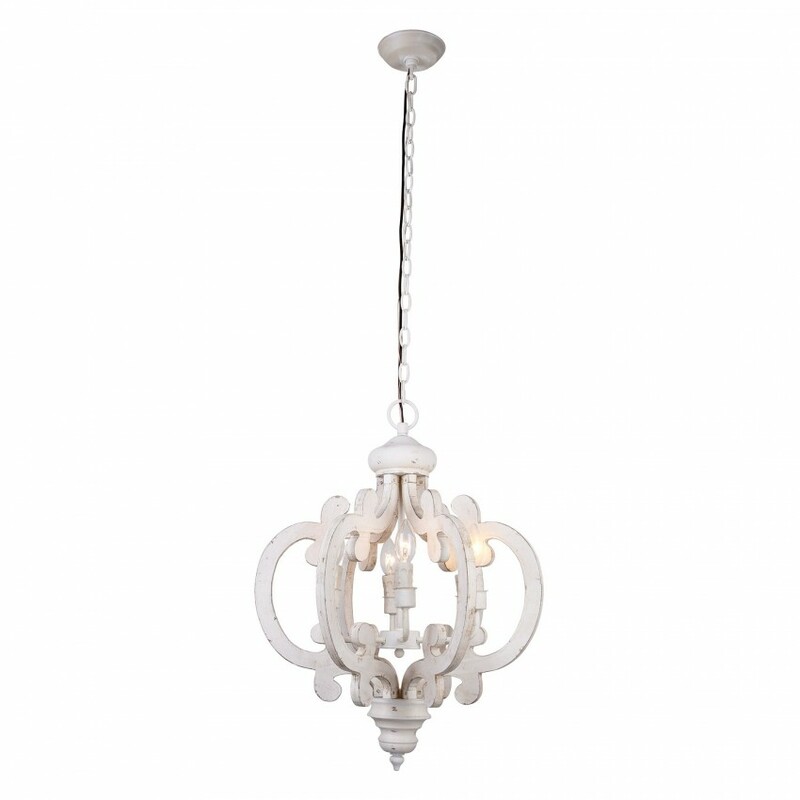 We're using frosted chandelier bulbs which look so pretty in this fixture. Our electrician said it wasn't easy to hang, but it's up and looks great and I'm really enjoying it. I cannot tell you how happy I am with this chandelier. It was already assembled perfectly in the box, and it looked exactly like the picture. I was able to easily replace my current Chandelier and it has made a remarkable difference. 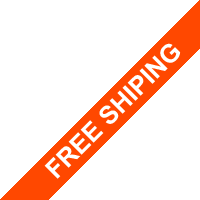 The construction was good and I would highly recommend this product without any qualms. I’m so in love with my new light fixture. It is going to look great in my dining room. Came fully assembled and shipped quickly. Is even nicer in person and nicley made. Can't wait to put it over my claw foot tub in our lake house. Love it! We remodeled our home 19 yrs ago and at the time funds were tight plus we could not find a chandelier that we really liked for our dining room. We had looked over the years and nothing ever really spoke to us - or just couldn't justify the cost and we just sort of forgot about it. 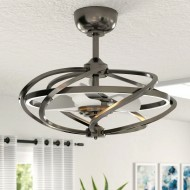 I was not looking when I ran across this chandelier on Whoselamp.It was on sale and I fell in love with it. It came quickly, was not hard to install and is perfect for our space. We could not be happier. I am in love with this Chandelier!! I get a lot of compliments on it, would highly recommend!! Beautiful addition to my home very classy love it! This chandelier is even prettier in person. It is larger than I expected but this is a bonus as far as I'm concerned. I could not be happier with this purchase! 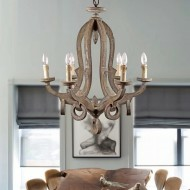 I bought this chandelier for my foyer which will have a large concrete French country mirror and a large wood grain bin. 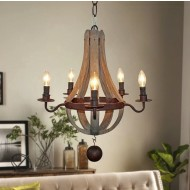 This chandelier will compliment our rustic/French country decor and furniture. The price point on this chandelier was right on for me. I'm happy with this purchase. It did however have one ding on the wood piece. I'm hoping it won't be noticeable once it is hung. This is such a unique light fixture. I was looking for something distressed for our beach condo; I needed it to be small in size since we only have 8ft ceilings. We've not installed it yet, but we're so thrilled with our choice. There are traces of gray/blue and beige in the distressed areas. Lovely. The chandeliers we received have a different ceiling cap than the one shown. Absolute pain to install, ceiling mount makes no sense. Good luck! This beauty took us 3 hours to install. As other reviews have mentioned, the mechanics of the light make no sense and when installing on a vaulted ceiling makes it even worse. Thank God we love it because we were both were ready to throw it out the window. haha!Seriously though, it's a stunner and was the icing on the cake in our master bedroom.We started out with 40W chandelier bulbs and WAY too bright!Used 25W and it's perfect!1 star for install. 5 stars for overall appearance. I was not disappointed with this chandelier. It was exactly as pictured, and the vintage finish was very authentic looking. It looks just like a wonderful flea market find from an old home. We hung it in our breakfast nook, and it looks perfect. This is well made, beautiful color and shape, lightly distressed, perfect for master closet. Love this light too. Bought it along with another light . They go well together and will certain make a statement. This piece appears to be good quality. It's large enough to use as a center piece in mid-size bedroom or in a dining room. We are using it as a corner fixture and are considering putting it on a dimmer because it provides quite a bit of light. It did require some electrical and dry walling since. Very cute.